Bannack is a ghost town in Montana that rivals the exciting history of any Wild West town in the United States. Now a state park, it was once a booming mining town filled with miners, gamblers, thieves, gangs, and murderers. In fact, the infamous Plummer Gang ran this town for a short time, and many believe that they were responsible for over 100 murders in the country around Bannack and nearby Virginia City. The town itself started as so many others, springing up from out of the sagebrush following a rich gold strike. 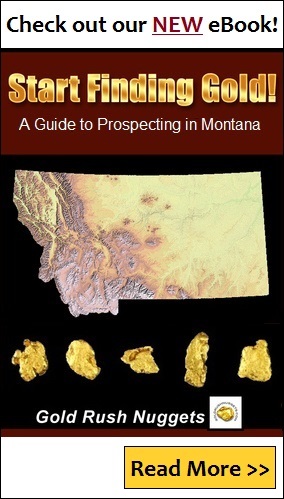 It was the discovery of placer gold in Grasshopper Creek in the summer of 1862 that did it. A group of “Pike's Peakers” from Colorado stumbled upon the creek while traveling through this remote part of what is now Beaverhead County, Montana. This is where Montana’s first gold claim was officially filed. As is so often the case, word of the new discovery traveled quickly, and by the fall of 1862 there was a population of approximately 400 people along Grasshopper Creek. By the following spring, those numbers grew to over 3,000 at Bannack. The first miners worked the placers using simple methods. Pans, sluices, and rocker boxes were all successful in working the shallow placer deposits that were found along the creek. However, as time went on, and the easiest ground had become worked over and the gold depleted, new methods were now needed for recovery. Of course, hardrock mining quickly followed the initial placer discoveries, as gold was traced back to its source veins. Stamp mills were used to crush rich ore, and some considerably rich strikes were made just outside of Bannack. The constant stamping of ore was a familiar sound in Bannack, but certainly one that was welcomed as it was the sound of prosperity and wealth being created. As the easy placers became depleted, a ditch and flumes were constructed to transport water from over 30 miles away. Once this was finished, the miners were able to use water to work the higher bench deposits above Grasshopper Creek, many of which were just as rich in gold as the creek itself. The preferred method was to hydraulically mine these bench deposits. This mining method was used all up and down Grasshopper Creek for many miles and the evidence of it can still easily be seen today. High pressure water is run through large cannons called monitors, and the hillsides were literally washed away. The slurry that was produced was then run through sluice boxes below. In later years, bucket line dredges were used to work the gravels of Grasshopper Creek. In fact, the first successful dredge in the western hemisphere was constructed here by a man named F.L. Graves in 1895. Over the next few seasons, several other dredges were built, and as many as 4 were operating on Grasshopper Creek during the dredging boom. Dredging along the creek lasted for about 7 seasons, at which time a few of the dredges were abandoned where they sit. One was transported to John Day, Oregon, and the other to nearby Alder Gulch to work the gravels there. As fascinating as the mining history of Bannack is, the town is probably best known for being home to the infamous Plummer Gang. Although true records will perhaps never be known, some believe that there were as many as 102 murders that Henry Plummer and his men were responsible for. The area was truly the Wild West. And the town in general was extremely wild. Gunfights and stray bullets from drunks at the saloon were common. The gallows that Plummer was hung from are still there today, as is much of the town of Bannack. Now a Montana State Park, the town is easily one of the best-preserved ghost towns in the western United States. Many structures such as the Assay Office, County Courthouse, hotels, saloons, churches, and many homes are still there. Old mining relics can still be found scattered around the townsite. Over 60 structures are still in place today, most very well preserved. Visitors can go inside many of the old buildings and get the feeling that they are there during the old mining days.